From our submersibles to our ROVs, from our elite dive team to our support vessels, we completely facilitated the Nekton Bermuda Mission: The XL Catlin Deep Ocean Survey by teaming with UK-based conservation organization, Nekton Foundation. The multidisciplinary scientific research mission investigated the state of the deep ocean around Bermuda, Sargasso Sea and the NW Atlantic, resulting in the discovery of over 100 new species and the Rariphotic Zone (Rare Light Zone) of the ocean between 130-300m. Scientific Research: Create a new standardised framework for deep ocean research and a baseline of the state of the ocean around Bermuda and the NW Atlantic Ocean. 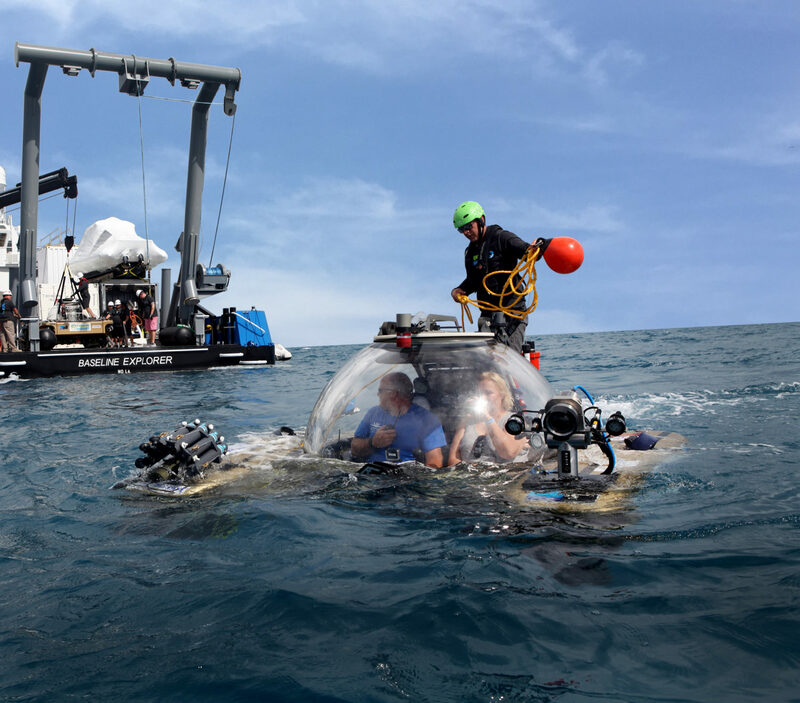 Capacity Development: Pioneer new research adaptations for submersibles and divers and provide grants and opportunities for leadership and involvement in Mission operations across marine science, conservation and ocean management in Bermuda and the NW Atlantic. Public Engagement: Promote the research and exploration of the ocean as a gateway for public engagement and increased ocean prioritization. Education: Create and a launch a new educational programme, Submarine STEM, freely distributed and linked to global curricula to accelerate ocean literacy. Policy: Engage public and political support for improved ocean management around Bermuda, and create actionable data to accelerate sustainable ocean governance in the region. Research was focused around the Bermuda Platform in the western central Atlantic. The purpose was to identify patterns in the distribution of life across a series of locations, while concurrent documenting the environmental (chemical and physical) parameters of these sites. The Bermuda Platform is the eroded stump of a large volcano which formed during the Eocene (<45 MYA) and Oligocene (33-34 MYA) and is the largest of four volcanoes which run in a line trending north east and which include the Plantagenet and Challenger Banks and Bowditch Seamount. Although volcanism ceased in the early Oligocene, the seabed continued to swell into the Miocene forming the Bermuda Rise which is about 1,500km long and 500- 1,000km wide. Further offshore Bermuda is surrounded by the Sargasso Sea, an oligotrophic anticyclonic gyre traditionally associated with free-floating rafts of Sargassum weed. The Sargasso Sea ecosystem is vitally important as a migration route, foraging and spawning ground for threatened and iconic species of whales and sharks as well as several important, but now declining, commercial species including the European freshwater eel and blue-fin tuna. Located 200km southeast of Nova Scotia, the Gully Marine Protected Area is the largest submarine canyon in eastern North America. It is home to a wide variety of organisms, including cold-water coral, diverse fish species and more than 14 different kinds of marine mammals, including the endangered Scotian Shelf population of Northern Bottlenose Whale. 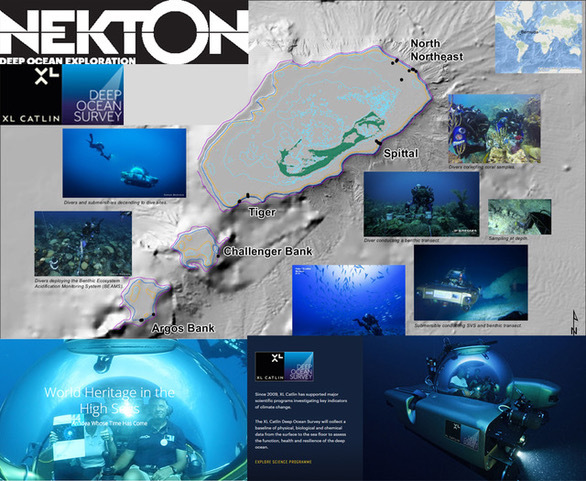 UE & Project Baseline teamed with the Nekton Foundation​, a UK-based conservation organization, to conduct scientific surveys, using submersibles and deep CCR teams, of ocean and reef conditions in the mesophotic zone in the vicinity of the Bermuda Islands and the Argus and Challenger Banks. This mission was supported by the research vessel Baseline Explorer. Specific mission objectives also focused on the collection of video transects, and coral and algae samples, by rebreather divers certified with the Global Underwater Explorers​. Divers were conducted to depths between 30 and 100 meters depth. (100-330 Feet) Video and photographic documentation of large animal life including several species of game fish and tiger sharks were also included in many research dives.